After looking upon a MOC of such greatness and such terror, I am compelled to destroy myself by jumping into a bottomless pit of hopelessness and despair. This is instantly one of my favourite MOCs EVER. I'm also intrigued at the story behind it... what's it from? Now I'm really just Z. You definitely have the talent for combining the morose with LEGO. I really mean that in the best way. You�ve had some really gloomy dioramas, but this has got to be one of the creepiest ones I�ve ever seen. It really gives me the willies, excellent job on this. 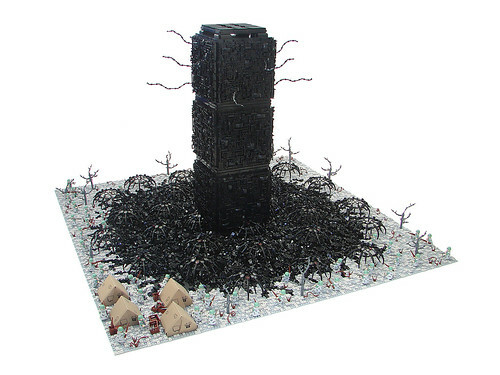 You�re like the Clive Barker of LEGO, dude. You continue to stun, Nannan. Amazing work, truly a piece of art in every sense. High-concept and though-provoking, not usually what you'd associate with Lego, and all the more amazing for that reason. Nannan, I'm sure I've said it before, but I'll say it again, I actually kind of worry about you. Though absolutely amazing, possibly your best, this is just so incredibly creepy. It's kinda hard to put down my feelings for this in words. The more I look at it the more it impresses me. How big is it though? 150 studs? 200? Many, many kudos to you Nannan, this is just awesome. I learned that to get the most out of conveying the horror, I had to stay awake past midnight to write my backstories. That's when my conscience really wakes up while my body falls asleeps. Joedward- no worries man, it's all cool in real life. Though I must say a 100% happy man won't be able to make something like this. I had to recall upon unhappy past experiences and memories to propel me through the project at times. I only skimmed over it, hoping there was a bigger story I could get into instead. So you mean to say this is an original creation? If so, it is far more impressive. To turn someone elses' work into a model is one thing, but to represent your own? And in such an amazing display? Wow. I'll be sure to go back and read that story in detail. No, this is just impossible. I hereby refuse to believe in the existence of this MOC. It simply defies all boundaries, with awesomeness immeasurable. It therefore is a figment of our imaginations caused by mass hysteria. ...Also, your backstory is amazingly well written and suits the creation perfectly. Praise be Nannan. Awesome work as always. Love the story too. Honestly, can anyone beat Nannan? How many baseplates did you use? Great work Nannan. This is pure badbooty.